Lockridge, whose most famous bout was a highly celebrated knockout of Roger Mayweather almost 35 years ago this month, turned pro in 1978. The Tacoma, Washington native went on to win his first 16 fights before dropping a split decision to Eusebio Pedroza in a 1980 world featherweight title bout. Lockridge would finally win a major title in 1984, with his KO of Mayweather. 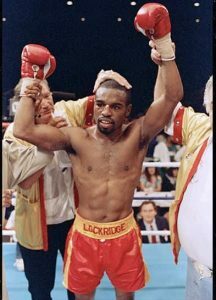 In all, Lockridge won The WBA and IBF titles in the super featherweight division (at different times) and faced some of the best names of a great era of boxing. Among Lockridge’s notable opponents were Mayweather, Cornelius “Boza Edwards,” Wilfredo Gomez, and Julio Casear Chavez, who Lockridge dropped a majority decision to in 1986. After he left the ring, Lockridge became a known entity again, albeit for less glamorous reasons. The man’s battles with drug addiction eventually landed him on the show Intervention. On the brighter side, Lockridge was said to have been sober for around ten years at the time of his death, meaning he had spent roughly a decade free of his addictions. No small thing. Although non-fight fans may remember Lockridge for Intervention, fans will mainly remember the 44-9-0 fighter for his incredible performance against Mayweather. The 22 year old Mayweather was a 17-0 champion who had won four straight by knockout when he stepped into the ring to face Lockridge that day. Lockridge, who was ranked number three at the time, was encouraged by energetic cornerman Lou Duva before the opening bell. Mayweather was hoping to have a unification matchup with fellow featherweight titlist Hector “Macho” Camacho. It wasn’t going to happen. The 24 year old Lockridge knocked his man out in 91 seconds of the first round with a thunderous right. Lockridge had walked into the fight a 4-1 underdog that day in Beaumont, Texas.